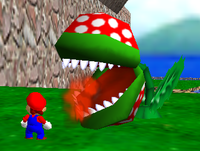 Pluck the Piranha Flower is the first mission of Tiny-Huge Island in Super Mario 64 and Super Mario 64 DS. The objective is to defeat the large Piranha Flowers. The mission in the N64 version. The easiest method of reaching the Piranha Flowers' location is to start on Tiny Island. The player then needs to jump across the platforms near the start and enter the Shrinker Pipe. 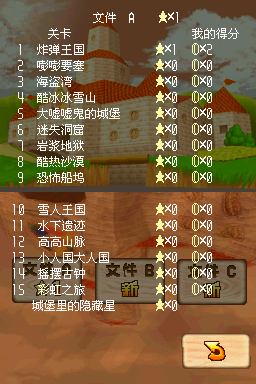 If the player starts on Huge Island, they will have to go around the entirety of the course. Upon jumping out of the Shrinker Pipe, or upon reaching the platform if the player went around the course, the player will then have to move around the platform to find the five Piranha Flowers. If the player is nearby, the Piranha Flower will grow out of the ground and attempt to spit fire at the player. 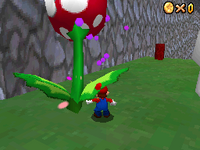 To defeat one, the player needs to attack it once, which will cause it to shrink like a normal sized Piranha Plant. Once all five of the Piranha Flowers are defeated, the Power Star will appear next to the Shrinker Pipe. This page was last edited on February 12, 2019, at 15:16.